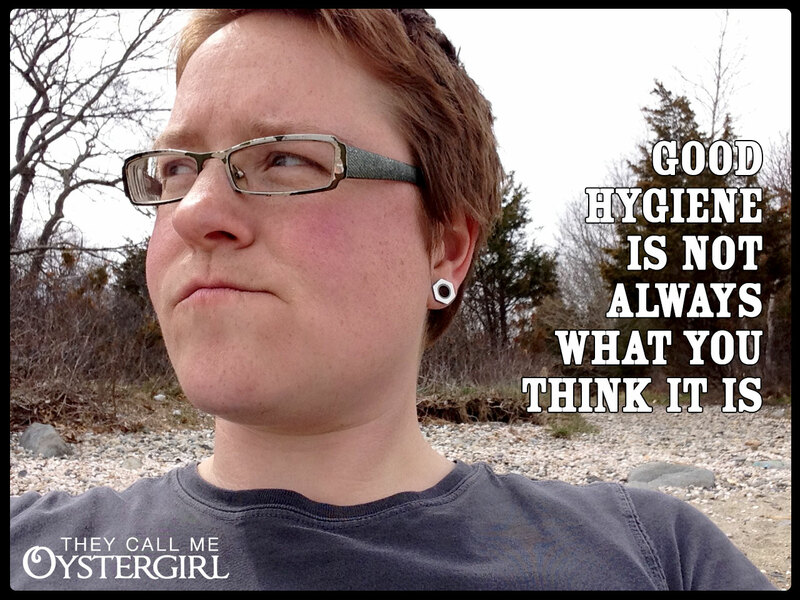 In part 1 of “Good Hygiene Is Not Always What You Think It Is”, I began the story of how I changed from the constantly-compulsively-cleaning agent of mainstream synthetic hygiene I grew up as, to the crunchy, hairy, au natural, only mildly dirty hippie you smell before you. It began when I was 20 and continued through college, where I learned a lot about the cultural construction of hygiene and was exposed, for the first time, to people who were neither mainstream in their body care nor gross. I also learned how cleaning our bodies with products, especially chemically-based ones, destroys our body’s natural cleaning process and pheromone release. This transformation was a long process. The journey continues. I lived in Scotland in 2004, and worked for a middle-aged woman who presented herself rather conservatively. I was surprised to find out that she never used soap on her body. She said that soap messed with the pH balance of our skin. I was inspired. It hadn’t occurred to me that I could go without soap. I stopped using soap on my body. I would go through the same body-cleaning routine in the shower, only just washing my hands. There was no real difference, except that my skin was less dry, and I got compliments on the lovely smell of my skin! “What do you use?” Hahaha! We decided that his hair had so much character BECAUSE he didn’t use shampoo: he didn’t bludgeon it into lying slack and dull. Once again inspired, I stopped using shampoo. That transition period, unlike the soap one, wasn’t so smooth. My hair got really gross, oily, and sticky. Never one to stick with things based solely on principle, I washed it after a couple of weeks. It felt weird!, so smooth and slippery. I couldn’t keep my hands off it. Then I didn’t wash it again, and it was fine. It was very short at the time, a grown-out buzz cut. I am thankful for that; I may not have made it otherwise. This was before I learned about shampoo alternatives like the “no ‘poo” method of using baking soda and apple cider vinegar. My shampoo alternative was water. When I learned about BS/ACV, it just seemed like too much work. My hair was just fine without shampoo. In fact, my hair was BETTER without shampoo. I never again had to deal with staticky hair, a constant wintertime problem. My hair developed character, like my boss’: I could kind of style it, because of its natural oils (which were no longer gross and sticky), rather than it just lying flat. I didn’t miss the “smooth and slippery” feeling; in fact, as with shaving, I got kind of weirded out by it. Did you know that our bodies are self-cleaning? 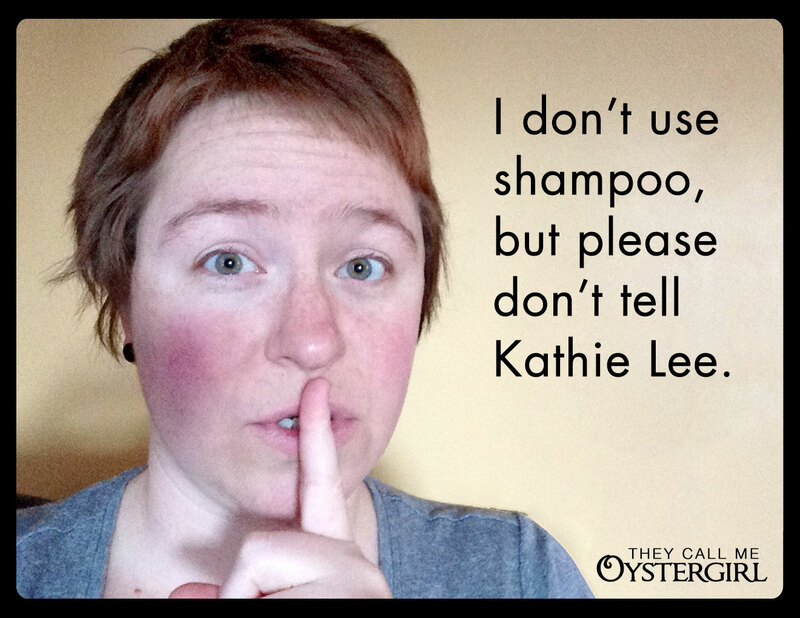 When we use things like soap and shampoo (even “natural” ones) we tell our bodies they don’t need to clean themselves anymore. Using these products perpetuates itself. You can’t go too long without them, once they’re part of your routine. When you give them up, it takes time for your self-cleaning process to come back. But it does come back. My self-cleaning became fully functional again. I went down to showering every other day. I knew I was on the right track when a co-worker “couldn’t” come into work one day because she was getting work done on her house and didn’t have hot water and therefore could not shower. I vowed to try to not be attached to any particular hygiene regimen. The journey continues with a grounding trip to Ireland. In the summer of 2008, I went to rural Ireland to volunteer for the Flat Lake Literary and Arts Festival. I slept wherever my hosts had room; for more than a week, I stayed in an old farmhouse that only had a tub. Because I worked all day and partied all night, I didn’t have time for a bath! I was outdoors most of the time, running around all day, doing sometimes intense manual labor. I even had a couple of flirtations, which ordinarily would send me into hygiene paranoia. But it didn’t. I was fine. I smelled fine; I looked fine. It didn’t occur to me to look or be any differently. When I got off the farm and into Dublin, I took a long and well-earned shower. When you take showers all the time, they’re just normal. When you earn them, they’re wonderful. Upon returning home, I was forever altered. I showered when I felt like it, when I needed to. This averaged once or twice a week. That bring us to today. I roll in and out of bed with ease, go through my day without needing to sniff myself or check myself in mirrors. I take care of my teeth twice a day (now with homemade tooth powder and mouthwash), and if on occasion I don’t get to it, so be it. I am uninhibited and un-self-conscious about the state of my hygiene. I also know, because I am allowing my body’s cleaning process to take place, that I am not disgusting. But that’s all about perception, isn’t it? I am probably disgusting to someone who is abluted and scrubbed and perfumed and plucked and lord knows what else. But frankly, I find them a little gross—or at least perplexing. And please, keep that nasty, synthetic-smelling perfume AWAY from me!! UPDATE: One thing has changed: my hair. Women can experience lifelong changes to their hair (among other things) after being pregnant. I had a baby in 2011, and afterward my hair got darker, thicker, and more oily. After conceding to the fact that I needed to use something other than water, at least once in a while, I discovered J.R. Liggett’s Bar Shampoo, from a blog post about Victorian Shampoo Alternatives. It’s made primarily from olive oil, coconut oil, and castor oil. I only use it every few weeks, or every few months—you know, just whenever, I don’t keep track—and my hair is right as rain. The use of products perpetuates itself. By giving up these products, we are making ourselves healthier. I am living proof of that. Mine is not an uncommon story. …and that concludes part two. ^^ graphic inspired by Kathie Lee and Hoda’s “review” of LittleOwlCrunchyMama’s post, “Haven’t Washed My Hair For Three Years”. LOVE your attitude! At first I thought I was just a lazy…uh, what did you call it?…crunchy, hairy, smelly, etc person because I just thought all that cleaning, grooming, plucking, face-to-face stuff in front of a mirror was a bore. And leg/underarm shaving; Oh My Dog! What a time consuming, blood letting occupation is that!! I praise God that I was born when I was and so became a teen at the end of the 50’s which put me smack dab in the sprouting of the hippies there in SoCal/Hollywood where I tramped around. By the time I graduated from high school (’64) I was more than ready to burn my bra, let my hair do it’s thing and wear all kinds of comfortable and colorful clothes. Let’s not talk about the drugs ‘cuz THAT wasn’t such a great idea. I am so disappointed that so many of my peers caved in to the cheap marketing hype. I mean I’m REALLY disappointed. Where’d they all go?? We were changing the world folks!! I’m afraid a lot of my early cohorts ended up being corporate businessmen selling adulterated granola, shampoo, yogurts and frozen veggie burgers full of toxic additives but wrapped in “groovy” packaging. You know what I mean.